1. Laura Elizabeth James: born August 6, 1847 in Georgia; married in 1867 to Ruben McCullough (1848–1916), son of Warren McCullough and Perlina Miller; died July 17, 1917 (aged 69) in Gustine, Comanche County, Texas; buried at Shiloh Cemetery, Row 10-S, Comanche, Comanche County, Texas; known children include: William W. McCullough, Luther Sanford McCullough, Jake McCullough, Jess Franklin McCullough and Millie McCullough. 2. Thomas Alvin "T.A." James: born May 29, 1849 in Georgia; married to Martha Elisabeth Holifield (1867–1897); died July 11, 1923 (aged 74) in Comanche, Comanche County, Texas; buried at Shiloh Cemetery, Comanche, Comanche County, Texas; known children included: Delia Benie James and David A. James. 3. Luther Sanford James: born June 23, 1851 in Elbert County, Georgia; married to Martha J. Gordon (1854–1920); died April 17, 1939 (aged 87) in Union, Newton County, Mississippi; buried at Memorial Park, Union, Newton County, Mississippi. 4. William Marion James: born 1853 in Elbert County, Georgia; married December 23, 1873 in Newton County, Mississippi to Lucy A. McMahen; died 1926; buried at Memorial Park in Union, Newton County, Mississippi; known children include: William "Willie" Thomas James, Irvy James, Mack James, Henry Grady James, Samuel Nolan James, Lucius Lamar James, Lila James and Mabel James. 5. John Hamilton James: born January 29, 1855 in Elberton, Elbert County, Georgia; married March 1, 1875 in Newton County, Mississippi to Mildred Louella Jane Abney (1859–1930), daughter of John Beck Abney and Lucy M. C. Brown; died February 28, 1928 (aged 73) in Little Rock, Newton County, Mississippi; buried at Rock Branch Baptist Church Cemetery in Union, Newton County, Mississippi; known children include: Alonzo Lamar James, Lucy Elmira James, Benjamin Floyd James, Martha Ophelia James, William Clyde James, Luther Sylvester James, Maud Estelle James, Jesse Howard James, Karl Abney James and Etoile James. 8. Levingston Martin James: born February 29, 1856 in Elbert County, Georgia; married Evelyn James (1858–1930); died February 10, 1949 (aged 92); buried at Memorial Park in Union, Newton County, Mississippi; known children include: Walter Cammack James. 9. Ralph Edward James: born April 13, 1859 in Neshoba County, Mississippi; married in 1881 by James Milton Moore, Baptist Minister of the Gospel on "old Pete Hunter place" near Union, Neshoba County, Mississippi to Paralee Payne (1864–1950), daughter of Demos Cannon Payne and Sarah Elisabeth Kilpatrick; died 20, 1937 (aged 78) in Union, Newton County, Mississippi; buried at Memorial Park in Union, Newton County, Mississippi; known children include: Tommy James, Harvey Malcolm James, Edward Milton James, Bertie James, Minnie Alice James, Velma J. James, Pearl Cordelia James, Grover L. James, Melvin Loavelle James, Leila Grace James, Ida C. James, Ava D. James, Floyd Ollis James and Miley L. James. 10. Sarah "Sallie" Frances Mildred James: born July 6, 1861; married to John Robert Sansing (1857–1934), son of Francis Sansing and Nancy Combs; died December 3, 1926 (aged 65); buried at County Line Cemetery in Neshoba County, Mississippi; known children include: George Lev Sansing, W. R. Sansing, Oscar Lamar Sansing, Maude Rebecca Sansing, Emma Dale Sansing, Louella Sansing, Hattye Sue Sansing, Ada Alice Sansing and Leon Sansing. 14. Delia Abby James: born January 1, 1873 in Mississippi; never married; died December 31, 1907 (aged 34); buried at Memorial Park in Union, Newton County, Mississippi. William Elias James (1823-1881) was the son of Isaac James (1797-1880) and Elizabeth C. (E.) (1803-circa 1860) of Georgia. Family Records of Mr. & Mrs. Jeffrey Nathan James of Akron, Ohio, the great, great grandchildren of William Elias James (1823-1881). Find A Grave Memorial for Laura Elizabeth James McCullough (1847-1917), Memorial ID No. 71320142, created by Addie Ratliff, added June 13, 2011. Find A Grave Memorial for Thomas Alvin “T. A.” James (1849-1923), Memorial ID No. 52345869, created by Terry Teague, added May 13, 2010. Find A Grave Memorial for Luther Sanford James (1851-1939), Memorial ID No. 144858157, created by Laurie Ann Moore, added April 10, 2015. Find A Grave Memorial for William Marion James (1853-1926), Memorial ID No. 16839086, created by Natalie Maynor, added November 29, 2006. Find A Grave Memorial for John Hamilton James (1855-1928), Memorial ID No. 111240663, created by Alice, added May 27, 2013. Find A Grave Memorial for Levingston Martin James (1856-1949), Memorial ID No. 144858148, created by Laurie Ann Moore, added April 10, 2015. Find A Grave Memorial for Ralph Edward James (1859-1937), Memorial ID No. 144858204, created by Laurie Ann Moore, added April 10, 2015. Find A Grave Memorial for Sarah Frances M “Sallie” James Sansing (1861-1926), Memorial ID No. 87323922, created by Ed Sansing, added March 24, 2012. Find A Grave Memorial for Delia James (1873-1907), Memorial ID No. 144858064, created by Laurie Ann Moore, added April 10, 2015. 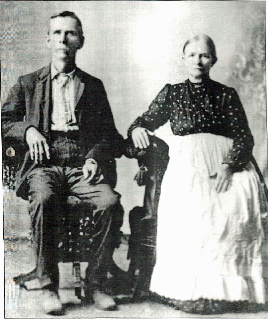 Below - Ruben McCullough (1848–1916) and Laura Elizabeth James (1847-1917). 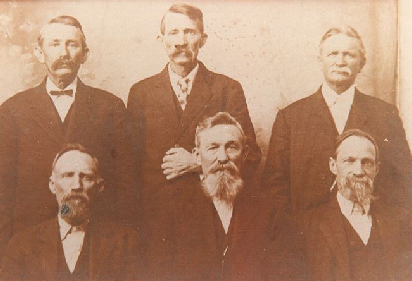 Below - Standing behind: Ralph Edward James (1859-1937), Levingston Martin James (1856-1949) and John Hamilton James (1855-1928); seated below: Thomas Alvin James (1849-1923), Luther Samuel James(1851-1939) and William Marion James (1853-1926).